The Date Range defaults to six months. To select a different date, type the date or click the calendar icon, then, click Search as shown in the image below. The Test Taker lists show test information for each test taker. This lists will start to show data as soon as the test taker logs into the test. Once the test taker completes the Self-Evaluation questions their responses will be averaged and displayed for the Self-Evaluation score. Writing and Speaking scores are typically available in 10 to 12 business days after completion of the test. They may be available sooner, so check the test results screen periodically to determine the grading progress. A minus sign after the level for a Writing or Speaking score indicates that of the four necessary ratable responses the test taker only submitted one. This serves as an alert that limited evidence was available to establish the score. You can also send an email to support for non-immediate requests and questions, listing the student login name, test code and providing a brief description of the issue or topic to help the support team investigate the matter and provide a response. 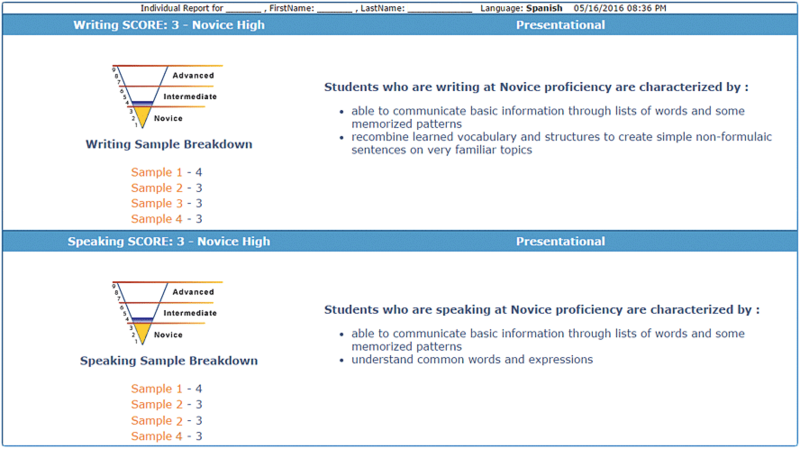 Individual Detailed Reports show the Writing and Speaking levels attained on the Avant WorldSpeak test for each test taker. They provide in clear, direct language what test takers at each level are generally able to do. An additional blue-filled area will appear if the test taker had one response that scored at a higher level. This serves as an alert that the test taker is operating across a range of proficiency levels with this skill. This situation is quite common for test takers in the Novice and Intermediate ranges, mostly due to limited topic exposure and control. To view or listen to the test taker's Writing and Speaking responses, click the score shown in that area of the detail report. The Writing response will be displayed. Click the Play button to listen to the Speaking response. From the Results Summary screen, click Download Excel File to create an Excel version of the summary test results. Use the downloaded file to customize the data or adapt the data to your needs.